I've mostly been pottering around with things at home. A bit of cleaning, a bit of ironing, a bit of playing with the puppy, a bit of revision for my theory test (next week, *gulp*) and occasionally a bit of knitting too. 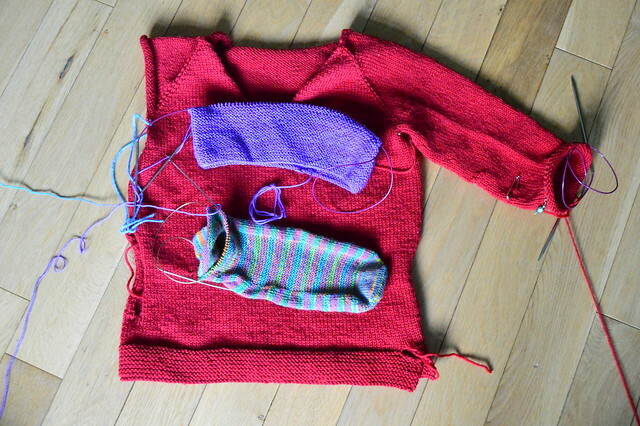 The red sweater has been waiting for me to try it on my son to see how much more length I need on the sleeves. I need to do another 4 inches or so before starting the cuffs so that will keep me amused for a while. My sock now has a heel and is nice and simple to knit again, much like the sleeves on the sweater. Seems that's what I'm in the mood for right now. Lot's of fun projects going on there. Good luck on your test next week! Your driving lesson story made me laugh - I remembered my poor instructor who had to take walking breaks to calm down :) Your WIPs are so colorful! Great progress on these projects. OMGosh, your driving lesson tidbits had me LOLing! I don't know how to drive a stick. You can drive anything after that. Learning to drive is hard. I think it's probably harder for an adult because we are more aware than teens of all the dangers! You'll make it!